Too much heat to handle? 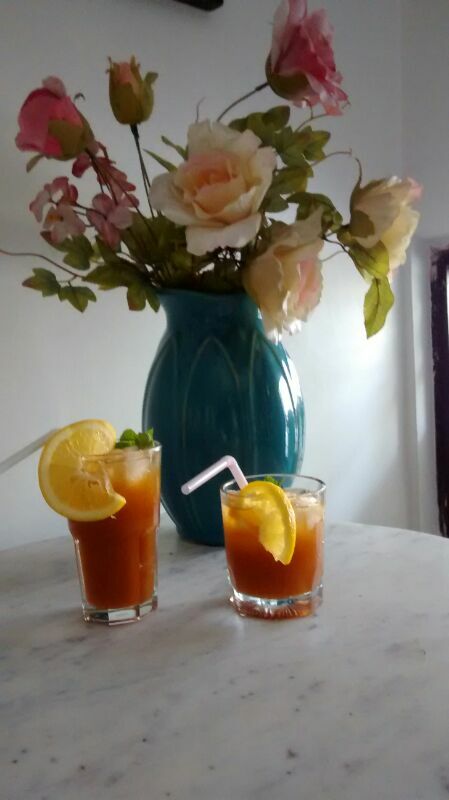 Well you need not worry, here’s very refreshing Orange Iced Tea to enhance your tastebuds. Enjoy this summer cooler!! 1. Put sugar, water, tea leaves, nutmeg, mint leaves and cinnamon in a saucepan. Simmer for 10 minutes. Add orange zest into the pan. Cover, cool and strain. 2. Add orange juice. In a tall glass, fill bottom rim completely with orange slices. Then followed by ice cubes. 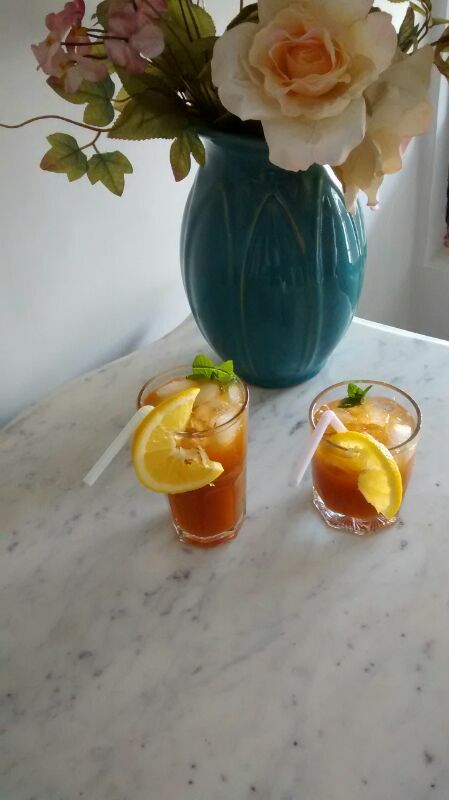 Now pour orange iced tea into your glass. Enjoy your drink!! I have been exploring for a little for any high-quality articles or weblog posts on this sort of space . Exploring in Yahoo I finally stumbled upon this website. Reading this information So i am glad to show that I’ve an incredibly good uncanny feeling I discovered just what I needed. I most no doubt will make certain to don¡¦t omit this web site and give it a glance regularly. Hey there! I simply wish to give you a big thumbs up for your excellent info you’ve got right here on this post. I’ll be coming back to your website for more soon. Thank you so much for giving everyone such a superb chance to read articles and blog posts from this web site. It’s always so enjoyable and as well , jam-packed with a great time for me personally and my office mates to search your site a minimum of three times in a week to learn the new guidance you have. Not to mention, I am just certainly fascinated considering the great pointers served by you. Selected 4 tips in this post are honestly the best we have all had. I wanted to send you one very small remark to be able to thank you so much yet again considering the nice guidelines you have featured on this site. It’s so strangely generous with you giving unreservedly all most people would have supplied for an electronic book to make some dough for themselves, most importantly considering the fact that you might well have tried it if you ever wanted. Those ideas as well worked to become a good way to fully grasp that many people have the identical zeal much like mine to learn good deal more when it comes to this matter. I know there are a lot more pleasurable instances ahead for people who view your site. You actually make it appear so easy together with your presentation however I to find this topic to be actually one thing that I feel I would never understand. It seems too complex and very vast for me. I am taking a look ahead to your subsequent submit, I¡¦ll try to get the cling of it! I want to express some appreciation to the writer for rescuing me from such a instance. After looking through the world wide web and obtaining ideas that were not beneficial, I assumed my life was done. Existing without the presence of answers to the issues you’ve resolved by way of your good short post is a serious case, and the ones that might have adversely damaged my entire career if I had not noticed your web site. Your primary expertise and kindness in touching all the details was precious. I am not sure what I would have done if I had not encountered such a subject like this. I am able to at this moment relish my future. Thanks a lot very much for the expert and amazing help. I won’t think twice to suggest the sites to any person who desires support about this topic. Thank you for any other informative site. The place else may I am getting that type of info written in such a perfect means? I have a undertaking that I’m simply now operating on, and I’ve been at the look out for such info. I really enjoy examining on this website , it has got superb content . “When a man’s willing and eager, the gods join in.” by Aeschylus. I¡¦ll immediately take hold of your rss feed as I can not to find your e-mail subscription hyperlink or newsletter service. Do you have any? Kindly allow me know so that I could subscribe. Thanks. Hey very nice blog!! Man .. Beautiful .. Amazing .. I will bookmark your site and take the feeds additionally¡KI am satisfied to find so many helpful information right here within the post, we want develop more techniques on this regard, thank you for sharing. . . . . .
I¡¦m now not positive where you are getting your information, however great topic. I must spend a while learning more or understanding more. Thank you for magnificent information I used to be in search of this information for my mission. Looking after your items is usually as equally important simply because in reality ordering these people. Something to not forget when picking out a sheet of diamond jewelry is usually to consider extended life on the model ,website,the particular part offers you. Whether it is some sort of trendier article that should drop totally out of favor rapidly look at alternate products which might be easy to maintain and cheaper. Gold real estate agent can be fantastic options for paying for cool and trendy pieces. Ordering special fine jewelry with actors is really a method to get some that’s special without spending a lot. It¡¦s really a cool and useful piece of information. I am glad that you simply shared this useful information with us. Please stay us informed like this. Thank you for sharing. I really wanted to type a simple word in order to say thanks to you for those fantastic techniques you are showing on this website. My time-consuming internet investigation has at the end been recognized with beneficial suggestions to go over with my colleagues. I would repeat that many of us visitors are undeniably lucky to live in a fabulous site with very many lovely people with beneficial tricks. I feel really lucky to have come across the site and look forward to really more cool minutes reading here. Thanks a lot once more for a lot of things. I¡¦ve been exploring for a little for any high-quality articles or weblog posts on this sort of house . Exploring in Yahoo I at last stumbled upon this website. Studying this info So i¡¦m satisfied to convey that I have an incredibly just right uncanny feeling I came upon just what I needed. I such a lot definitely will make sure to don¡¦t put out of your mind this website and provides it a look regularly. hello there and thank you for your info – I’ve definitely picked up anything new from right here. I did however expertise several technical points using this site, as I experienced to reload the site lots of times previous to I could get it to load properly. I had been wondering if your web host is OK? Not that I’m complaining, but sluggish loading instances times will sometimes affect your placement in google and could damage your quality score if advertising and marketing with Adwords. Well I’m adding this RSS to my email and can look out for much more of your respective fascinating content. Make sure you update this again very soon..
Greetings from Los angeles! I’m bored to tears at work so I decided to check out your website on my iphone during lunch break. I really like the knowledge you present here and can’t wait to take a look when I get home. I’m amazed at how fast your blog loaded on my mobile .. I’m not even using WIFI, just 3G .. Anyhow, good blog! whoah this blog is wonderful i love studying your articles. Keep up the good work! You already know, many persons are searching around for this info, you could aid them greatly. I’m just writing to let you be aware of of the amazing experience my friend’s daughter obtained browsing your webblog. She even learned so many things, which include what it’s like to have an incredible teaching nature to have the mediocre ones without hassle know just exactly several specialized subject matter. You really did more than her expected results. Thanks for showing such insightful, trustworthy, explanatory and as well as unique tips on your topic to Lizeth. You could definitely see your skills within the paintings you write. The arena hopes for more passionate writers such as you who are not afraid to mention how they believe. At all times go after your heart. I would like to thank you for the efforts you have put in writing this site. I’m hoping the same high-grade website post from you in the upcoming also. In fact your creative writing abilities has encouraged me to get my own blog now. Actually the blogging is spreading its wings rapidly. Your write up is a good example of it. I do trust all of the ideas you have offered to your post. They are really convincing and can certainly work. Still, the posts are very brief for newbies. Could you please prolong them a little from next time? Thank you for the post. hello!,I really like your writing very much! percentage we communicate extra approximately your article on AOL? I require a specialist in this space to resolve my problem. Maybe that’s you! Taking a look forward to look you.